All over Britain this year, we have been commemorating the 100th anniversary of the First World War. It is, therefore, rather discombobulating to stroll into the courtyard of the Royal Academy and be confronted by a squadron of U-boats from the Second World War. The shoal of battered subs has parked itself under the statue of Sir Joshua Reynolds and is thrusting creakily in the direction of Fortnum & Mason. You thought it was all over. Well, it isn’t. The U-boats (don’t worry, they’re in a glass box) are the handiwork of that relentlessly undiplomatic German artist Anselm Kiefer. When it comes to remembering Germany and its wars, Kiefer has 50 years of previous. It is not true to say that the war has been his only subject since he bullied his way into our artistic consciousnesses at the beginning of the 1970s, but it is true that the complications and textures of the war have whispered unsettling meanings into just about every artwork he has ever made. You thought it was all over. Well, it appears it cannot be. 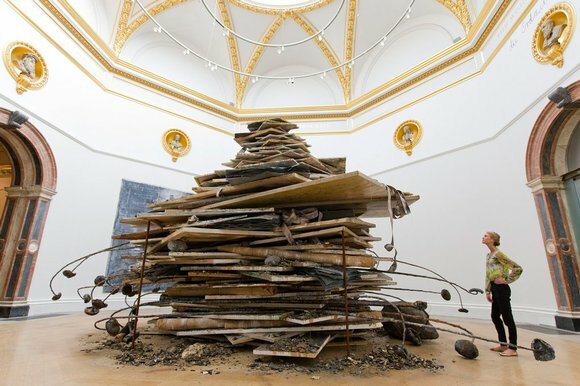 Amazingly, and to my eyes a touch ridiculously, Kiefer is now an honorary Royal Academician. Far be it from me, of all people, to judge the purity of national origins, but if the Royal Academy is not an organisation for the display and sustainment of British artists, what is it? Who next? Jeff Koons? Yayoi Kusama? Anyway, they’ve handed him not just the courtyard, but the entire suite of central galleries, where a mighty look back at his career bombards you blackly with the spiritual complications of being a postwar German. You thought it was all over. But how can anything end when it is not allowed to begin? The show opens brightly and surprisingly, with a busy room full of pint-sized watercolours and some modestly scaled sky-blue paintings of German monuments. It’s a surprise, because Kiefer doesn’t generally do pint-sized or sky-blue. Gigantic and black are more his thing. But a closer examination of the sky-blue paintings reveals a familiar figure at the centre of all of them, standing bolt upright, performing a Nazi salute. Ah, yes, the notorious Kiefer self-portraits. Even today, these creepy dressings-up in his dad’s war uniform prompt a hiss of surprise. Imagine the frisson when they were unveiled at the end of the 1960s, when so many European memories of the war were still so fresh. As acts of confrontation, they are utterly deliberate and, it has to be said, spectacularly on-point. The reclaiming of Germany’s past, not just from the Nazis, but from the postwar suppression of so many aspects of German iconography, is an exhibition-wide obsession for Kiefer. In one of the show’s best rooms, packed with sacred forests and burning brands, blood-stained snows and mad memories of Odin, the sense of an illicit Teutonic subject matter demanding to be let out is as insistent and noisy as a pack of hunting dogs in a cage. Kiefer was born to Catholic parents in the Black Forest in 1945. Reasonableness can never have been his birthright; being a Catholic in the Black Forest is freighted enough. Add being born in 1945 and you have a recipe for tortuous self-awareness. Lots of Germans must have had inside them what Kiefer had inside him: a sense of a lost past; a resentment at its suppression; so many churning memories of so much that was so significant. But most of them kept quiet about it. Kiefer did not. Several of the doomy wooden attics and huge, battle-scarred German forests that come next appeared at the Venice Biennale in 1980, where they caused an almighty rumpus. I reviewed them there and remember well the disquiet. Personally, I never had a problem with the idea of a German artist seeking to reclaim his buried mythological past: for me, it was like listening to Wagner. But for others, he wasn’t remembering, he was glorifying. The same paintings are here again. Parsifal is a huge triptych set in the bare wooden attic. (It was actually Kiefer’s studio at the time.) At one end of the attic is a baby’s cot. At the other end is a sword, embedded in the floorboards, with a second sword lying broken by its side. Scrawled above them is the word “Parsifal”. If you know your Wagner, you’ll know the sword refers to the one embedded in an ash tree by Wotan, the king of the gods, in The Valkyrie. Remember the poignant cry of Siegfried as he finds himself weaponless in the forest at night: “My Father pledged me a sword!” So this is a painting about lost legacies and blighted inheritances: a kind of spiritual self-portrait, not just of Kiefer, but of every postwar German. To my eyes, it’s a bit too Game of Thrones: loaded with mythological bunkum. But, as Debussy said of Parsifal when he heard it at Bayreuth, the plot may be ludicrous, but the music is “incomparable and bewildering, splendid and strong”. With Kiefer, too, the storylines are wonky, but the pictorial execution is thrilling. In Parsifal, the relentless convergence of the floorboards and repetitive bareness of the wooden attic create a sense of spiritual emptiness that cannot be ignored. Just as Wagner turned absurd Teutonic mythology into gorgeous music, so Kiefer makes such powerful art out of his tremulous Germanic fantasies. The thrusting interiors he began painting in the 1980s, in which he refers so problematically to the Nazi architecture of Albert Speer, are even more exciting: so looming, so empty. This is art that communicates through textures and scales: body to body. When Kiefer paints a field in which some torturous wartime memory is enacted, the image works not because its subject matter is so telling, but because the paint feels as if it has been churned up by a column of Panzers. His sensitivity to evocative materials grows as the show progresses. Books made of lead. Straw for a woman’s hair. A sky of lead with real diamonds embedded in it where the stars should be. Those invading submarines in the courtyard of the RA are as effective as they are because the tin they have been cut from has such a strong memory-tugging bathos to it. When dashed and hopeless dreams are being evoked, it’s hard to beat a material that looks as if it started out as an old tin bath discovered at the bottom of the garden. All this is impressive. But it could do with some tonal variation: a bit of chamber music sprinkled among the symphonies. The display searches for exactly such moments in a couple of small selections devoted to Kiefer’s mysterious watercolours. But even these, lovely as they are, with their delicate blobs and spreadings, reveal such doomy prognostic plotlines as they go about connecting the gothic openings of some tempting nudes with the great cathedrals of France. So that’s what the fall of Adam led to. Largely successful until now, the show ends clunkily with a set of cornfields inspired very obviously by Van Gogh. In earlier works, Kiefer had appropriated Van Gogh’s dried-out sunflowers and cast them as symbols of extinguished hopes and dreams. Here he gives us half a dozen huge cornfields in which the celebrated despair of Van Gogh’s final paintings is too easily borrowed and enlarged. Not for the first time at this event, the existential anguish feels phoned in.